Technical Transport Products are delighted to be a designated drop-off point for Cash for Kids: Mission Christmas appeal 2018. At TTP and Thermo King we are committed to supporting local charities and this Christmas, Cash for Kids is asking the local community to buy one extra gift and to leave it off, unwrapped at a drop-off point. We are proud to be one of those drop-off points! Just leave your unwrapped gift in to the shiny box beside Darryl at the front desk before Monday 17th December and we will pass it on to the appeal. The gifts go to local children who are suffering from poverty and who are unlikely to receive anything on Christmas Day. Cash for Kids are especially looking for gifts for babies and teenagers. Mission Christmas isn’t asking for anything big or expensive, just simple gifts that you could pick up with your weekly shop. We have included some gift ideas below. We will also be holding a Christmas Jumper Day on Friday 14th December to raise money for the Mission Christmas appeal. so, why not join in and wear the ugliest jumper you can find and make a donation! 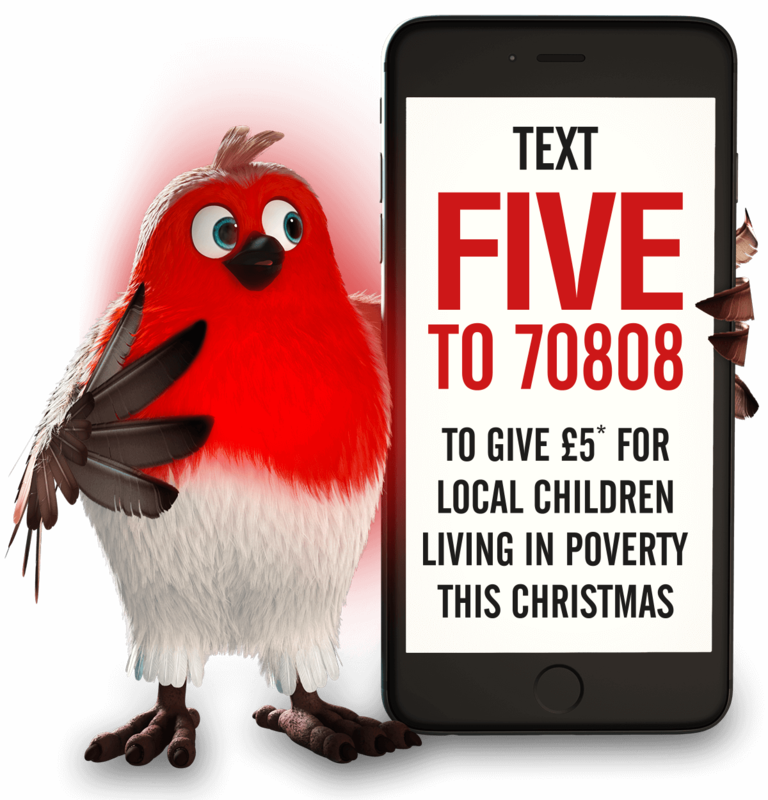 Just text FIVE to give £5 or TEN to give £10 to 70808*. You can make a one-off donation, set up a monthly direct debit or pay in money you’ve raised online. We are excited to make this Christmas a day to remember for local children. The Fresh Duck Company have just received delivery of their newest Thermo King unit. Steven Wilson, owner of the company opted for a V300 MAX 10 freezer unit for their Mercedes Sprinter van. The unit can chill to a temperature of -20oC and comes with a 2 year warranty providing a reliable and efficient solution to your temperature control requirements. This is the second Thermo King unit that the Fresh Duck Company have purchased. They had no hesitation in opting for a Thermo King unit after their previous experience. They also have a local dealer on their doorstep in Portadown. The new Technical Transport Products Sales, Service and Repairs Depot is in Carn Industrial Estate, just off Junction 11 on the M1. Call Tracy or Drew on 02825646481 to find out how we can meet your temperature control requirements. Follow us on Facebook and Instagram to find out more about TTP. Just click the logos below! TTP are proud to sponsor Ballinascreen U14 Hurlers as they embarked on the All Ireland Féile na nGael 2018 Division 2. A core aim of Féile tournaments is to promote a philosophy whereby every player has the opportunity to participate and play in their respective Féile tournament at a level commensurate to their age, skills and strengths. The Ballinascreen team was made up of 32 boys, 4 coaches and a physio. Initially, the boys travelled to Kilnadeema, Co Galway, where they played Tommie Larkins and Naas, qualifying them to travel to Galway the next day to take part in the quarter final. On our way to Galway! On Saturday the boys played Kilnadeema and then Castletown Slieve Bloom and they qualified for the semi-final – we were delighted for them! On the Sunday the team travelled to Connaught where we played Kilcormac Killoughey in the semi-final. We won – we were now in the final! The boys played Naas in the final, but sadly lost out on the win. However, the boys played a magnificent game, and we could not be more proud. the boys all played with a lot of heart and showed sportsmanship throughout every game. They represented Ballinascreen impeccably well. Although we did not get the result we wanted we leave with great memories! There’s always next year boys! As a local business we are delighted to support local young people. One way we do this is by sponsoring Randalstown Young Farmers Club hoodies. We have a special relationship with Randalstown Young Farmers Club, as Kathryn’s three children have been dedicated members for a number of years. The highlight of the Young Farmers’ calendar is, without a doubt, Balmoral Show. This year was no exception as this landmark agricultural event celebrated its 150th Show! Members of the Young Farmers Clubs of Ulster not only attended the Balmoral Show, but participated in many events and competitions. These ranged from sheep shearing to tug of war. One such competition was the Floral Art Finals. We are delighted to announce that our Stores Apprentice, Gemma Dickey, was awarded First Prize in the 21-25 years age category. This was a tough competition with competitors putting together a display live at the event with a theme of “Duet”. Under the watchful eye of Judge Karen Frew, competitors showed off their creativity and flair as they delicately placed flowers, foliage and other accessories to craft stunning arrangements. Over 400 competitors had taken part in the Floral Art heats and it was a remarkable achievement for the finalists to showcase their artistic ability at the prestigious agricultural event. Well done Emma,Gemma and Sarah, you have been excellent ambassadors for Randalstown Young Farmers Club we are so proud of you! You can find out more about the Young Farmers Clubs of Ulster here. You can find out more about the Balmoral Show here. Follow TTP on Facebook, Instagram and our Website for more news! TTP recently attended the Commercial Vehicle Show 2018.The CV Show is the largest road transport and commercial vehicle event held in Britain. It provides truck and van operators with far greater choice than can be found anywhere else in the UK. The Show attracts close to 21,000 business visitors and its central location at the NEC Birmingham, ensures a truly nationwide attendance. ThermoKings’s theme for the CV Show 2018 capitalized on both Thermo King’s 80th anniversary and Figoblok’s 40th anniversary and a combined 120 years of innovation. It proved to be the perfect theme for a show which has earned a reputation for delivering seasoned expertise and the latest innovative technologies each year. Thermo King and Frigoblok celebrated 120 years of innovation with the unveiling of this impressive cake. The Thermo King and Frigoblok CV Show stand featured the new SLXi Hybrid trailer refrigeration units. Innovative hybrid technology was introduced as a concept during the 2017 CV Show. It has now been turned into reality and combines expertise from Thermo King and Frigoblock for sustainable and cost effective urban and long-haul refrigerated transport. The SLXi Hybrid offers customers easier access to restricted, low-noise and low-emission urban areas, while lowering their environmental footprint and operating costs at the same time. If you would like to know more about the new SLXi Hybrid trailer unit please contact Drew or Tracy on ttpsales@thermoking.co.uk or 028 256 46481. Tracy and Kathryn attended to Thermo King Dealer Principal Conference in Marrakech, Morocco this year. The DPC brings together Thermo King dealers from Europe, Asia, Middle East and South Africa to discuss current affairs within the industry. The conference was full of exciting new innovations within the world of Transport Temperature Control which we cannot wait to share with you all. The conference also integrated Team Building activities between dealerships and some cultural exploration of Marrakech. We particularly enjoyed the mint tea! The highlight of the DPC was undoubtedly the Thermo King Dealer Awards where our video “The Fast and The Refrigerated” was debuted. It received a standing ovation and huge round of applause, we are so proud! Read our next blog to find out how Technical Transport Products performed on the night of the ThermoKing Awards…there were certainly some surprises! Follow us on Instagram and Facebook to keep up with the latest goings on at TTP.